Agha Noor Formal Collection 2019 constitutes of 23 ensembles in the earth and spring-inspired colors. Most of the pieces are constructed with material like organza, chiffon and French net. The starting price of this collection is 4,800. The beautiful floral embroidery on delicate fabric gives this a dreamy look. Agha Noor is famous for its delicate and sophisticated designs and this collection is a true reflection of the brand's ideology. As the name suggests this collection focuses more on formal wear. The elegant floral designs flaunt creative skills look very feminine. This Pakistani wedding dresses collection adds flexibility as you can wear the dress during the day and also on evening occasions. Most of the ensembles in the collection are either a single piece or two pieces. Due to the softer color palette, the Agha Noor Formal Collection 2019 is very flattering for all skin color specially desi skin tones. Though most of the designs are spring inspired in the collection. You can find a few bold colors like black and blue in the collection as well. 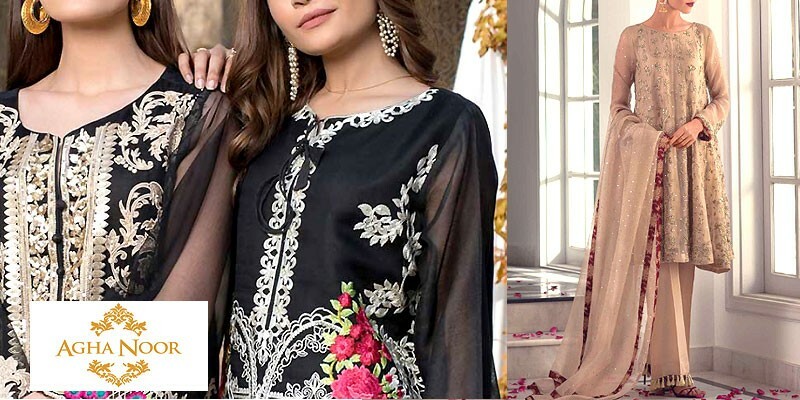 Agha Noor Formal Collection 2019 is officially available at their online store and can also be purchased at official retailers all across the nation.